Dennis Uyeno, a long time volunteer with Rebuilding Together Silicon Valley, helped renovate veteran John Moffett’s Woodland Estates home. How does a community show gratitude to someone who has selflessly served in the military, protecting and defending the freedoms America provides? Many people consider it a privilege to offer a handshake or a spoken message of gratitude. A Morgan Hill veteran received a much larger thank you — the gift of having his home restored and upgraded by Rebuilding Together Silicon Valley, Sears, and the Heroes at Home program. 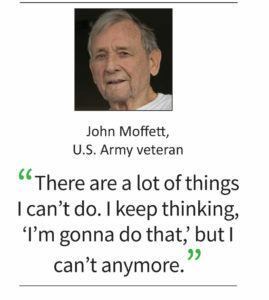 John Moffett, 81, served in the U.S. Army from 1960 to 1962, stationed in Germany during that time. 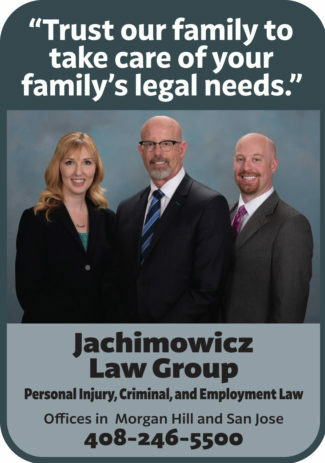 He was born in Corpus Christi, Texas, but moved to California with his parents when he was five. The morning of June 21, a team of about two dozen volunteers from Sears and Rebuilding Together took care of several projects for Moffett through Sears’ Heroes at Home program. These included critical repairs such as putting a new roof on his mobile home, re-carpeting the front steps and deck, replacing the steps by the carport, installing new flooring and painting in the master bedroom, painting the kitchen, landscaping, power washing the home, and installing interior and exterior grab bars. The tasks were projects Moffett intended to do himself … eventually. He’s been troubled by poor health, including prostate cancer, a triple bypass, and kidney failure. A massive blood infection, which he was unaware of, brought him to his knees in his kitchen. He laid there for three days before receiving the medical assistance he needed. As Moffett’s health became the top priority, repair projects and regular home maintenance understandably fell by the wayside while he battled to recover. From left: Abe Ramirez, from Sears, and Deanne Everton, the associate director at Rebuilding Together Silicon Valley, flank veteran John Moffett, holding a flag painted by and signed by Sears volunteers. Beverley Jackson, executive director of Rebuilding Together Silicon Valley, was on site for the project. She noted that although the rebuild tasks may seem minor — such as installing grab bars inside and new railings outside — their effects can’t be understated. That is often the crucial difference that enables aging homeowners to stay in their homes rather than going into an assisted living or other facility. Those small investments can add up to extended independence. Abe Ramirez, store general manager of the Sears in Visalia, attended the day of fixing up Moffett’s home. Heroes at Home was created through a partnership between Sears and Rebuilding Together. The nationwide program assists low-income members of the military, their families, and veterans with the home repairs and modifications they need. “This is about the right number of volunteers for a home this size. We have enough projects to spread around,” Beverley Jackson said. It takes some planning to coordinate the logistics of such an undertaking. In Moffett’s case, there are stairs on either side of his mobile home. That means the volunteers can’t work on both sets of stairs at the same time. But with a little forethought — and enough hands to help — the fix-up all gets done. The people working on Moffett’s home came from all over the Bay Area,and beyond, Ramirez said. “There are people here from as far away as Hayward, Fresno, Pleasanton, Santa Cruz, and Stockton,” he said. Moffett learned about the program from one of his fellow mobile home park residents. He wasn’t sure if he would qualify but was pleasantly surprised when he applied. Once a resident’s application is approved, wheels are put into motion. That’s when the team spirit really kicks in. “First, we preview the house and assess the number of volunteers needed,” Ramirez said. Terry Downing, the development and outreach manager at Rebuilding Together Silicon Valley, said the process usually takes about 30 days. After that, a plan is put in place, and all moving parts come together. Some tasks, such as replacing a roof, electrical projects, and other prep work, are done ahead of time. That way, when volunteers arrive on Rebuild Day, everyone can jump in and get started. Moffett said he was overwhelmed yet thankful for the experience. “It’s great they are doing this for me and will do it for other veterans,” he said. As metal railings clanged outside over the happy chatter of people working together, his face widened into a smile as he reflected on all that was being done. “It’s fantastic,” he said.